Polo T-shirt with Chinos Look: This look goes perfectly with your fitted chinos in navy blue or beige color. For footwear sneakers or loafers will give your look classic and a clean one. Add watch and belt for more style! But this look will go if you are planning for a casual day with your family and friends. But if you are embarrassed to style this look because of your short height, then you can buy height increasing shoes for men here. Polo T-shirt with Shorts: Planning for a beach party? Wear this look with loafers or flip-flops, this look is casual and comfortable. This look is an alternative to your basic T-shirt and shorts. But make sure, either the T-shirt is plain or shorts. Printed T-shirt and printed shorts will be a fashion disaster. Denim Look: For this Eternal look you need to pair your denim in light blue and avoid wearing black! This look is perfect if you are going to your college, school or extra classes. But make sure your denim is well fitted because Polo T-shirt does not go well with washed and distressed denim. For footwear, you can wear loafers or sneakers. Polo T-shirt with Track Pants: This combination is best for those men who enjoy style and love comfort too. You can style this look for vacation spots. On That Note: Guys! 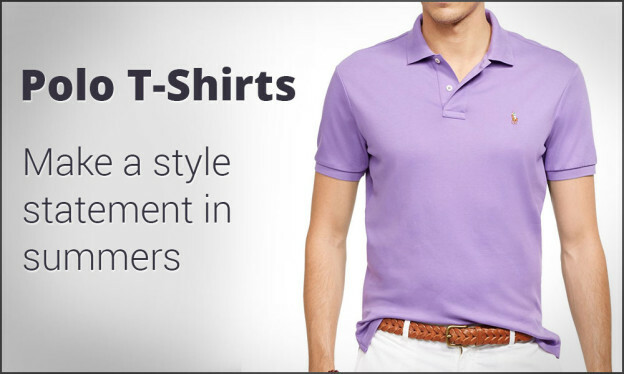 It's time to flourish your look with Polo T-shirt!